Type K Thermocouple Daughter Board is specifically designed for the DuetWifi and the DuetEthernet that allows two Type K Thermocouples to be attached. This board is based on the MAX31855 chip so only Type K thermocouples are supported. The DuetWifi and DuetEthernet support up to two daughterboards, with a further two on a Duex2 or Duex5 expansion board, with 4 daughter boards a total of 8 thrmocouples are supported. Thermocouple and PT100 daughterboards can be mixed and matched. Flexible motor coupling for 5 mm motor shaft and 8 mm lead screw, ideal for driving high-precision axes. 5 mm motor coupling is a great solution for driving axes which require high-precision low-backlash movement. PT100 Daughter Board This is a daughterboard specifically designed for the DuetWifi and the DuetEthernet that allows two PT100 temperature sensors to be attached. These PT100 sensors can be either two or 4 wire, there are jumpers on the latest version of the board for easily switching between two and 4 wire mode. Z-Probe pressure sensor allows the hotend to be used as a Z probe, gives you fantastic accuracy across the whole build area by eliminating the effect of tilt. 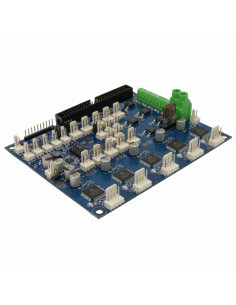 The Duex5 are expansion board for the Duet WiFi and Duet Ethernet. They are not compatible with the Duet 0.6 or 0.8.5.